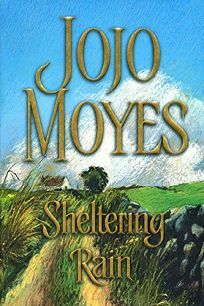 Loosely based on the story of her own grandparents, Sheltering Rain is the impressive debut of U.K. author Jojo Moyes. Joy and her husband, edward, meet during coronation festivities in Hong Kong in 1953. Forty years later, they are living on a ramshackle Irish estate, where edward's health is rapidly declining. Their spunky granddaughter Sabine arrives and is at first miserable in the grim surroundings. Weeks later, she is followed by her flighty mother, Kate, from whom Joy has been estranged for years. There are plenty of fireworks among the three and the strong supporting cast as old secrets come to the surface in this absorbing family drama. National advertising.